Sea mollusks (sea shells) have about them the natural luster and shine of sea water pearls. These outer coverings are made of calcium carbonate —the same mineral composition found in human and animal teeth and bones. It accounts for the shells’ natural durability against breaking when cut and shaped with metal tools. It can stand grinding and can be polished to a high gloss with minimal application of pressure and abrasion. Thus, seashells make for beautiful, and lustrous finish in beads, pendants, cutlery, and furniture accents. In contemporary jewelry designs, seashells add a touch of nature’s soft elegance with endless design possibilities. Shells are inexpensive and easy to process even with crude hand tools. 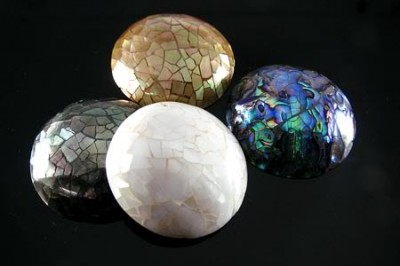 Here are handcrafted samples of jewelry components —pendants made from paua, black lip, abalone, and brown lip shell varieties. These pendants are made of cracked shell inlaid on wooden pendants or solid poly resin base. The unique dome-shaped feature of the pendants contribute to the shell inlays’ glimmering effect specially when hit by direct light giving it that “glamour look”. They are best worn on solid color dresses with simple necklines. So, get in style and experiment with simple combination of sleek necklines and one of these shell pendants. This entry was posted in Bead and Jewelry Fashion. Bookmark the permalink.